Our Philadelphia motorcycle accident lawyer represents bikers and motorcycle passengers injured in negligently caused traffic accidents. Because bikers are protected by nothing more than helmets and clothing, they are especially susceptible to severe accident injuries or death. According to the National Highway Traffic Safety Administration (NHTSA), biker deaths are 27 times more common than deaths of other drivers. Injuries to bikers who survive traffic accidents can be catastrophic. Cases handled by our Philadelphia motorcycle accident lawyer frequently involve motorcycle crash injuries caused by driver negligence. Motorcycles can easily be overlooked by larger vehicles, making bikers highly vulnerable to traffic accidents. Poorly maintained roads and badly designed construction or repair sites can also result in motorcycle accidents and serious injuries to bikers. Certain companies and individuals responsible for road maintenance, construction, and repair may be liable for motorcycle accident injuries caused by their negligence. Note: Governmental entities may be immune from liability under State law. Federal Motor Vehicle Safety Standards (FMVSS) govern the manufacture of motorcycles. Cycle defects (due to FMVSS violations or other design, manufacturing, or warning flaws) may contribute to motorcycle accidents. If a defect causes or contributes to an accident, the manufacturer and others in the chain of distribution can be liable for resultant injuries and deaths. Were you injured in a motorcycle accident due to someone else’s negligence and/or a defective bike or helmet? 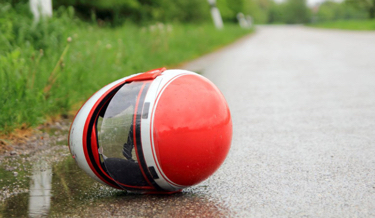 Our Philadelphia motorcycle accident lawyer can help you obtain the compensation you deserve. Contact us today for a cost-free evaluation of your case.